Rolex Ref. 6202 Gilt Dial Special Forces Turn-O-Graph Rolex, Turn-O-Graph, Oyster Perpetual, case No. 950471, Ref. 6202. Made in 1954. Fine and very rare, center seconds, self-winding, water-resistant, stainless steel wristwatch with black bezel and a stainless steel Rolex Oyster bracelet. C. Three-body, polished and brushed, screwed-down case back and crown, bidirectional revolving graduated black bezel with red arrow showing the zero point, case back later engraved: J.M. McFadden – Ranger – Special Forces - 1959. D. Black with luminous round, triangular and baton indexes, outer minute/seconds track. Luminous gold skeleton hands. M. Cal. 620, rhodium-plated, 19 jewels, straight line-lever escapement, monometallic balance, shock absorber, self-compensating Breguet balance spring. Dial, case and movement signed. Diam. 35 mm. Thickness 12 mm. Last edited by StampeSV4; 25-02-2010 at 21:22. This is an interesting inscription. There was only one SF Group in 1959 and no Ranger battalions, though Ranger school existed (Ranger units were formed during wartime and disbanded afterwards until the Vietnam War). The chances of someone in 1959 being SF and Ranger qualified are very slim, probably not more than a few dozen people could be described as such. The chances of one of them owning a Rolex are pretty good as the Sub has always been a popular watch with SOF types. The chance of a watch surviving and coming to auction...? Wish I had a contact at Human Resources Command who could look Mr. McFadden up. TBH, if I had these kind of funds available on 10 March, I'd put them towards the UDT Bulova. That watch has been on sale on eBay. Can't find a link, nor any other info - which seems odd for such a 'rare' beastie! You'd think that the story would have been researched - it would add a lot of value. OTOH, someone would have to have big ones to fake an engraving on such a rare beastie. Great photos and not a surprising story - AQ are a business and know next to nothing about watches. And the photos point up another concern I have about the crispness of the engravings on Lot 325. 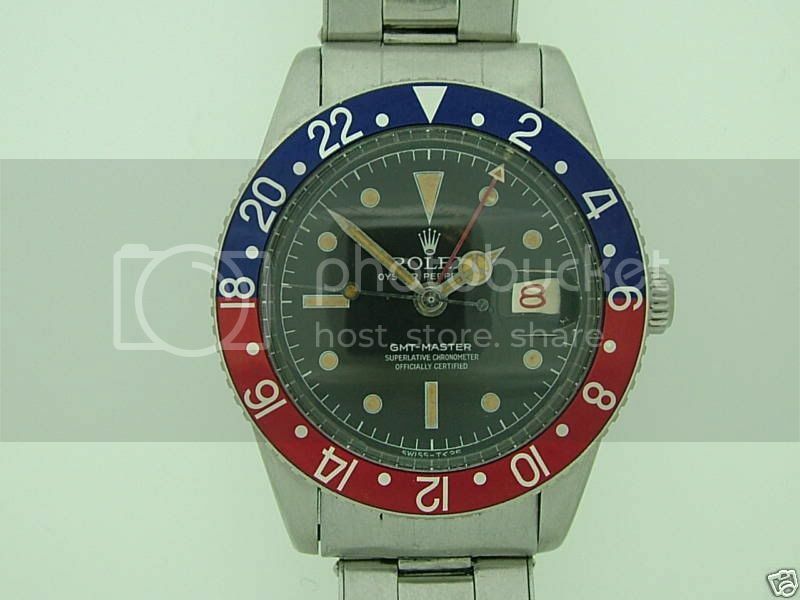 Here's another Rolex with an alleged military connection, ebay item 290407874911. "A Rare Gentleman Rolex GMT- Master 1958 in Very good condition no Crown Guard .
. The Ref Number: 6542 and serial Number:427327. The case is in great condition No rust or corrosion. The diameter of the case is 37 mm without the winder and 47 mm with the luges. The Dial in Mint conditon. The bezel is a beauty. The Movement is original and sing Rolex 25 jewels 1030 in working order. The Movement has been serviced and running beautifully. 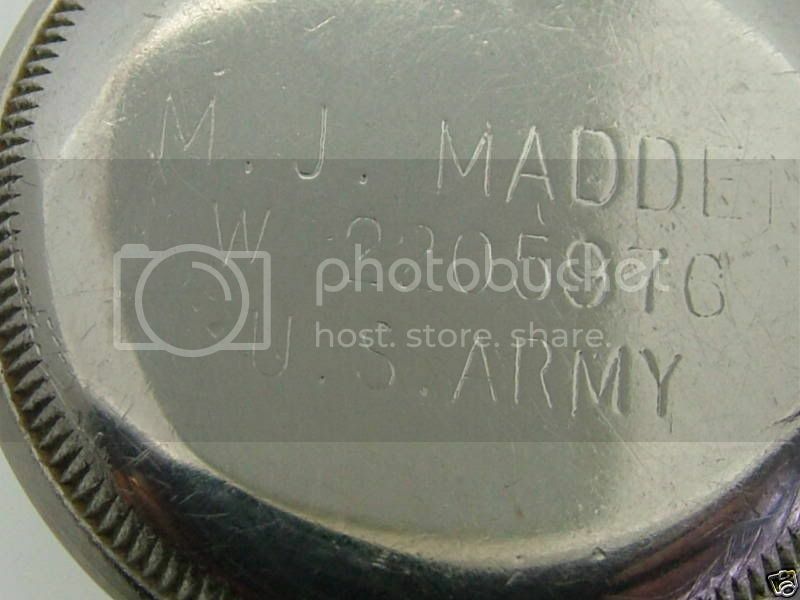 An unusual feature to this particular watch is the engraved case back. 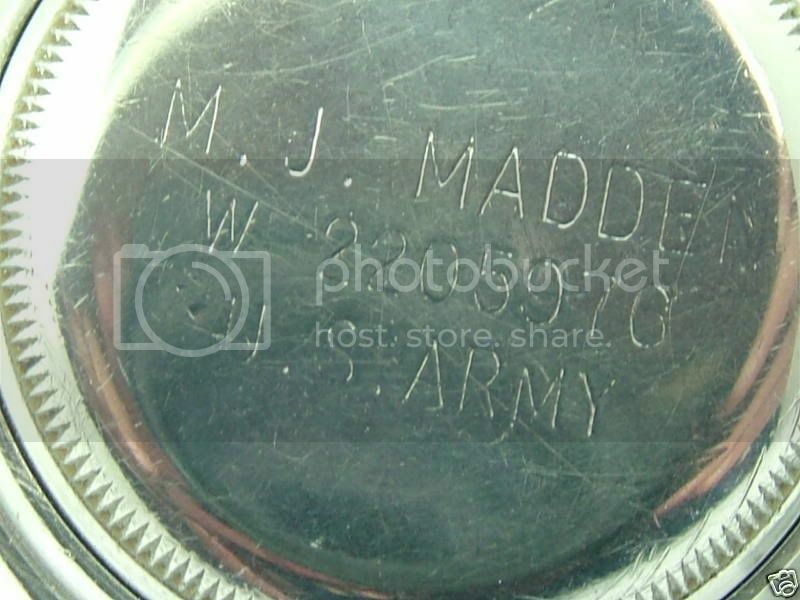 Clearly done by machine and not by hand, it shows the first owners name M.J.MADDEN W2205976 U.S.ARMY". Wear is more consistent with the age of the watch on that one. Correction: the seven digit number isn't consistent with the owner being US Army. He should have had an eight digit number. I'm going to check this with my father - I'm sure he still knows his SN.